Here’s a bold statement: Avoid selling traditional art in your live auction, unless you’re running an art-only auction. 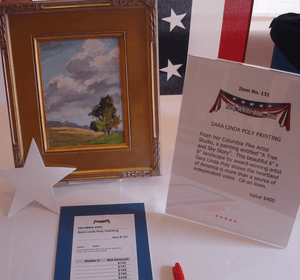 Traditional art pieces — items like sculptures, paintings, drawings, and mixed media which are produced by a professional artist who makes his or her living from selling artwork – are risky auction items for the standard, non-art benefit auction. It’s just too subjective. What I like, you don’t. What fits my home décor, doesn’t match yours. Art has limited appeal, but we want to sell items with broad appeal. Your school can sell artwork made by the children. Sometimes art is included in the live auction. A respected donor might insist that you sell her artwork. Or a well-meaning Board member has a best friend who happens to be a “great” artist. This Sara Linda Poly landscape sold quickly in the silent auction. Many of the gala’s guests already collected her work. 1. Well-known local artists sell better than non-local artists. An Orville Bulman reproduction had aggressive bidding activity in Palm Beach, FL fundraiser. A Sara Linda Poly landscape sold immediately at the highest price point available in Arlington, VA. These local-to-the-area artists enjoyed great sales, but switch these two pieces of art to the other location and watch the bidding suffer. Your guests will enjoy supporting local talented artists. 2. Ask the artist to donate a piece that is in an achievable price point. An artist might regularly sell his pieces for $10,000, but if your audience is a $2000 crowd, you’re going to have a lot of work ahead of you to get that piece to sell close to value. Give the artist a price range of what your audience typically spends on various items so he can select something appropriate. But don’t put the art in the live auction just because the artist suggests you should! Artists want to protect their reputation, so they don’t want to sell a piece for less than a given price because they fear it will affect the value of their other work. 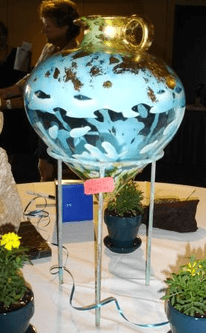 Some artists make a donation with the stipulation that the item can’t sell unless it reaches a given price. You, on the other hand, are less concerned about protecting his reputation … you just want to convert the item into cash for your cause. So if you are offered a piece of art with this stipulation, you might be better off to decline the donation. The piece might never sell, and then it will become a “ball-and-chain” donation. What’s a ball-and-chain donation? Earlier this year I worked an auction where the same piece of art has been for sale three times in a silent auction. No one would buy it for the required price. The event manager had to take responsibility for moving the item … protecting it from harm … storing it …. She hauled it around to every fundraiser like a ball-and-chain! And, the audience had seen the same brightly colored print for three years. Click here to read Part 2 of selling art in your auction. This is very helpful advice! I am sharing it with my nonprofit followers on Twitter. I’d almost think “duh!” – this is all common sense – but the truth is, it’s NOT. I can’t begin to say how often I’ve argued (politely) with clients that just because the artist/photographer wants their work in the live auction, that doesn’t mean it belongs there… And we’re the ones who look foolish for including it. It sounds like you’re doing a good job of managing expectations, Jessika. It’s not so easy to do!